Search for images based on visual characteristics – easily, efficiently, and intuitively. Traditional keyword-based searching for images is typically cumbersome and unintuitive, and often yields inaccurate results. The ever-increasing volume of images you need to manage, sort, navigate, and search through makes it that much more challenging. Now, using our ground-breaking visual search engine, you can easily, efficiently, and intuitively search for images based on their visual content through their visual characteristics, like colors, positions of colors, presence of faces, and textures. Search by any of these characteristics alone or in combination, and vary their values on-the-fly to fine tune your search. Even use one image as a starting point to find other visually-similar images. And if keywords are included as additional criteria as well, you get even more effective results than ever before. Search by color – find images that contain that color, or set of colors, you specify, in the per­cen­tages you set. Vary the colors and per­cen­tages to find exactly what you are looking for. Search by color position – Want to find images with specific colors in a specific area? Just search by color position. 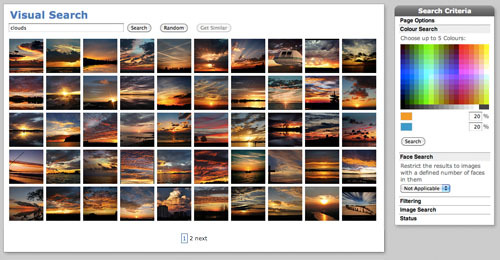 Search using an image – Use one image as a starting point to find visual similar images. A picture is worth a thousand words, so why not start with one? Search by faces – Search for the presence of one or more human faces.